This Spring, Better Homes & Gardens wants to help you create your own garden retreat with the BHG $10,000 Sweepstakes 2018. 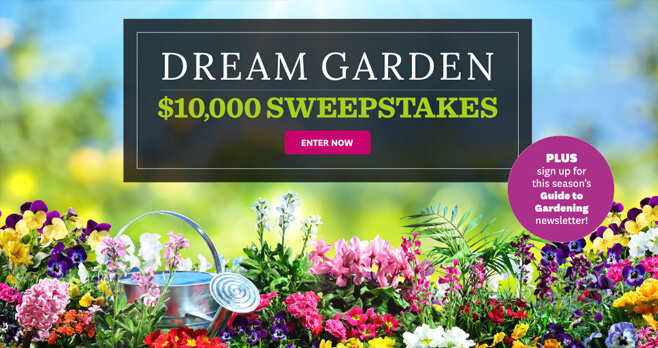 Go to BHG.com/10KSpring and register as often as you wish through June 30, 2018 for your chance to win $10,000 for a dream garden. Who Can Enter? The BHG $10,000 Sweepstakes 2018 is open to legal residents of the 50 United States and the District of Columbia, 21 years of age or older. When To Enter? Sweepstakes begins at 12:01 a.m. CT on 2/15/18 and ends at 11:59 p.m. CT on 6/30/18. What Is The $10,000 Sweepstakes Prize? The Grand Prize consists of a $10,000 check. Who Are The BHG Sweepstakes Winners? For the name of the winner, available after 7/31/18, send a separate, self-addressed, stamped envelope to; Winner’s Name Better Homes and Gardens $10,000 Sweepstakes, 1716 Locust St., LS 321, Des Moines, IA 50309. If there was a place to enter this sweepstakes, I could never find it. There is so much junk on the page you just keep getting sent to different websites. I agree Joyce! I can’t find out where to enter either. YOU CANT GET TO THE SWEEPSTAKES!!! This is disappointing from BHG. Probably a scam.